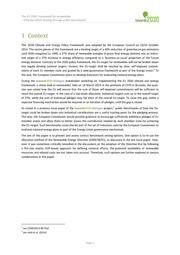 The ‘2030 Climate and Energy Policy Framework’ was adopted by the European Council on 23/24 October 2014. The centre pieces of this framework are a binding target of a 40% reduction of greenhouse gas emissions until 2030 compared to 1990, a 27% share of renewable energies in gross final energy demand and an indica‐ tive target of a 27% increase in energy efficiency compared to a ‘business‐as‐usual’ projection of the future energy demand. Contrary to the 2020 policy framework, the EU‐target for renewables will not be broken down into legally binding national targets. Instead, the EU‐target shall be reached by clear, self‐imposed commit‐ ments of each EU member state and guided by a solid governance framework as part of the Energy Union.1 To this end, the European Commission plans to develop indicators for evaluating national energy plans. During the towards2030‐dialogue stakeholder workshop on ‘Implementing the EU 2030 climate and energy framework: a closer look at renewables’ held on 18 March 2015 at the premises of CEPS in Brussels, the ques‐ tion was raised how the EU will ensure that the sum of those self‐imposed commitments will be sufficient to reach the overall EU‐target. In the case of a top‐down allocation, individual targets sum up to the overall target of 27%, while the sum of individual pledges may fall short of the overall EU‐target. To close this gap, either a separate financing mechanism would be required or an iteration of pledges, until the gap is closed. 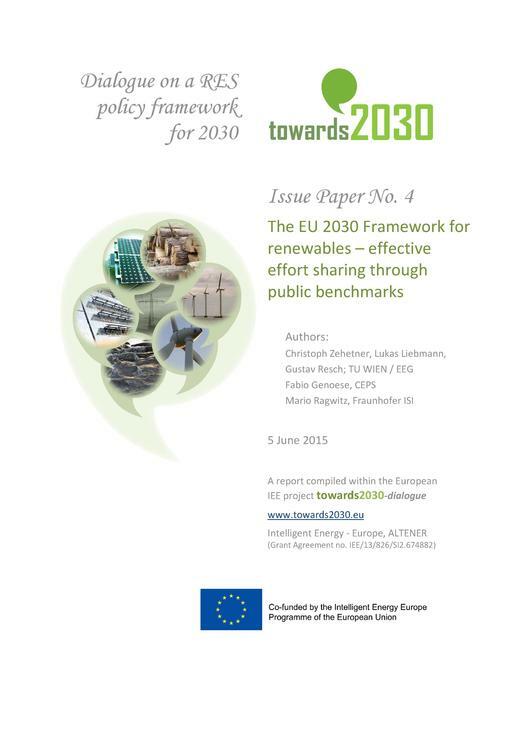 As stated in a previous issue paper of the towards2030‐dialogue project,2 public benchmarks of how the EU‐ target could be broken down into individual contributions are a useful starting point for the pledging process. This way, the European Commission would provide guidance to encourage sufficiently ambitious pledges of EU member states and allow them to better assess the contribution needed by each member state for achieving the EU‐target. Such benchmarks could also be part of the set of indicators used by the European Commission to evaluate national energy plans as part of the Energy Union governance mechanism. The aim of this paper is to present and assess various benchmark setting options. One option is to re‐use the allocation method of the Renewable Energy Directive (2009/28/EC), as discussed in the last issue paper. How‐ ever, it was sometimes critically remarked in the discussions on the adoption of the Directive that by following a flat‐rate and/or GDP‐based approach for defining national efforts, the potential availability of renewable resources and related costs are not taken into account. Therefore, such options are further explored in various combinations in this paper. This page was last modified on 18 September 2015, at 11:06.